The oil spill off the Gulf of Mexico is even worse than previously thought, with twice as much oil spewing into the ocean than earlier estimations suggested, figures show. Latest estimates from scientists studying the disaster for the US government suggest 160-380 million litres (42-100 million US gallons) of oil have already entered the Gulf. Most experts believe there is more oil gushing into the sea in an hour than officials originally said was spilling in an entire day. It is the third � and perhaps not the last � time the Obama administration has had to increase its estimate of how much oil is gushing. The revised figures suggest the disaster will be far more costly for BP, which has seen its stock plummet since the 20 April explosion that killed 11 workers and triggered the spill. Shares tumbled almost 7% to a 13-year low yesterday over fears that the US department of justice could block the company's dividend, due next month. This morning the shares bounced, rising 7%. If the flow continues, it will easily become the worst oil spill in peacetime history. The Exxon Valdez disaster of 1989 involved a comparatively minor 41m litres of oil. "This is a nightmare that keeps getting worse every week," said Michael Brune, executive director of the Sierra Club, the biggest grassroots environmental organisation in the US. "We're finding out more and more information about the extent of the damage � Clearly we can't trust BP's estimates of how much oil is coming out." Trying to clarify what has been a contentious and confusing issue, US officials gave a wide variety of estimates last night. US Geological Survey director, Marcia McNutt, who is co-ordinating the figures, said as much as 8m litres a day could have been flooding into the Gulf, twice as much as the US government has ever conceded to up to now. The estimate was for the flow before 3 June when a riser pipe was cut and then a cap placed on it. No estimates were given for the amount of oil gushing from the well after the cut, which BP said would increase the flow by about 20%. Nor are there estimates since a cap was put on the pipe, which already has collected more than 11m litres. The estimates are incomplete and different teams have come up with different numbers. A new team from the Woods Hole Oceanographic Institute came in with even higher estimates, ranging from 3.8m litres to 8m litres a day. If the high end is true, that means nearly 400m litres have spilled since 20 April. Even using other numbers that federal officials and scientists call a more reasonable range would estimate that about 238m litres have spilled since the rig explosion. By comparison, the worst peacetime oil spill, 1979's Ixtoc 1 in Mexico, was about 530m litres over 10 months. 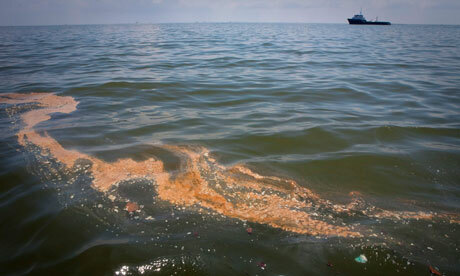 The Gulf spill has not yet reached two months. The new figures mean Deepwater Horizon is producing an Exxon Valdez-size spill every five to 13 days. Previous estimates had put the range roughly between 1.9m and a 3.8m litres day, perhaps higher. At one point, the federal government claimed only 160,000 litres were spilling a day and then it upped the number to 795,00 litres.